The Marlborough bedroom range is a high quality collection of pieces crafted from solid American oak finished with a beautiful waxed finish. 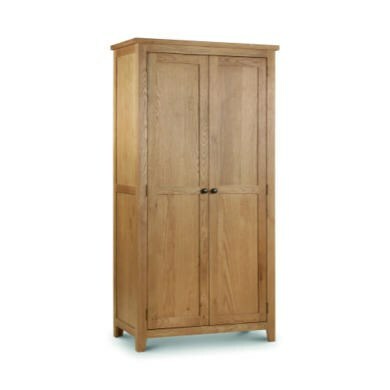 The wardrobe has a classic look, fitting perfectly into a variety of bedrooms. This 2 door double wardrobe is an ideal solution for storing your clothes and keeping your bedroom neat and tidy. The full length hanging rail and generous storage space provide you with more than enough room to keep your clothes tidy and crease free. Unlike the rest of the Marlborough range the wardrobe is delivered flat packed, as it is a large item. Easy to follow step by step instructions are included as well as all fixtures and fittings however you will need to provide your own tools.